(WHERE TO FILE THE CASE) Complaint to a consumer court, the home buyer will have to determine the value of his subject matter and compensation claimed is above 1 crore for the jurisdiction and file the case depending upon. As per the recent judgments of the National Consumer Commission, a group of buyers can jointly file a complaint before National Consumer Commission and their cumulative claim will determine the pecuniary jurisdiction of the National Consumer Commission. Therefore, now a home buyer who has purchased a property worth 10 lacs can approach directly National Consumer Commission in case he along with other buyers who all are together filing a case under Section 12 (1) (c) in total cross the at least a figure of 1 crore. A home buyer can file the complaint with the RERA Authority of the State where the property is situated. (AFTER THE VERDICT, WHERE WILL THE APPEAL FILED) Before the RERA the only court of appeal for the parties is the Supreme Court, After the verdict from the National Consumer Commission. After the adjudication of dispute by the Authority under RERA, an appeal will lie to the Appellate Authority, after Appellate Authority to the High Court of the State where the property is situated and then finally to the Supreme Court. As per the RERA there is only strict time frame of 60 days for deciding a matter for the Appellate Authority. PROJECTS WHICH ARE THE ON-GOING PROJECTS AND HAVE BEEN DELIVERED PROJECTS Go to the National Consumer Commission for the apartment or flat which has been delivered by the Builder but has any defect or problem. 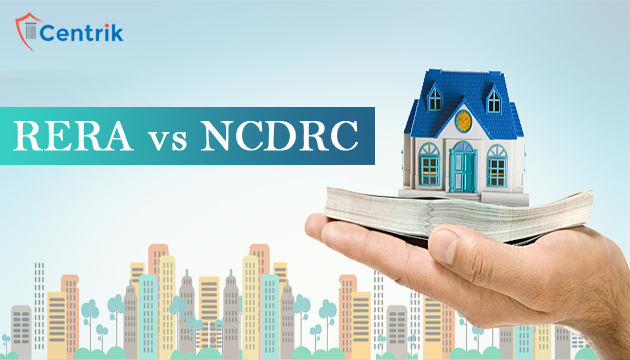 Since RERA has been obtained by some states, home buyers for the on-going projects where the builder has obtained part completion certificate and are outside the Scope of RERA, the aggrieved home buyers can still go to the NCDRC or other subordinate consumer courts. The all projects where the occupation and completion certificates are granted before the RERA, 2016 are outside the scope of RERA. Since RERA has been obtained under the Rules by some states, home buyers for the on-going projects where the builder has obtained part completion certificate will be outside the scope of RERA. LEGAL REMEDY DURING PENDENCY Under RERA there is no bar while approaching appropriate authority to initiating any sought of proceedings against the Builder to claim his relief. As per the rules for states, specifically take an undertaking from the complainant at the time of making a complaint to the authority under RERA, that the home buyer has not made any other complaint. This clearly limits the right of the home buyer to claim relief. COMPLAINANT NOT PENDING WITH ANY OTHER COURT Complainant further declares that in any matter regarding which complaint has been made but now is not pending before any authority or court of law or any tribunals. Complaint under FORM ‘CRA’ As per rule 28 (1) of RERA, 2016. The quintessential of the above article is that now the time has come in our economy where the redressal on aggrieved buyers can be resolved at the earliest as RERA, 2016 is a very easy and time-saving process.